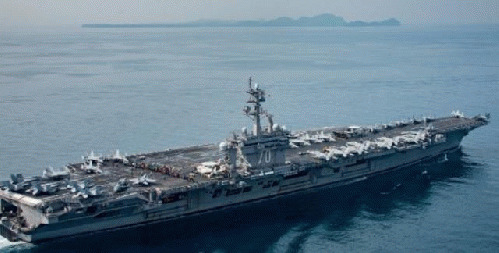 North Korea is threatening to destroy the US with its thus far largely undeliverable and sometimes unexplodable nuclear weapons, while the US, after an embarrassing navigational "mishap" that saw it steaming in the opposite direction, has successfully dispatched the USS Carl Vinson carrier battle group to a position reportedly within "strike range" of North Korea (albeit actually still in the South China Sea near the Philippines, some 1200 miles distant from North Korea). Now President Trump is threatening a possible attack on that country if it won't halt its nuclear weapons program. So is the Korean War, which never really ended, going to be reactivated, as scare stories are now warning? While I often find myself the pessimist in these kinds of crises, given the penchant for US presidents to turn to war as a default foreign policy option, I'm guessing that won't happen in this case, and for the same reason I don't think we will see US troops confronting the determined ethnic Russian secessionists in eastern Ukraine. It's clear that for years the imperialist policy of the US government, under both Republican and Democratic presidents, has been to create chaos in regions of the world from the Middle East to Africa and Latin America, the better to control uppity countries like Libya, Syria, Venezuela, Bolivia and Brazil, whose leaders try to buck or stand up to US dictates. But it's one thing to overthrow a government and decapitate its leadership in a place like Libya or Syria, where no powerful state is located nearby to defend that country. It's altogether another to take on a country that lies right on the border of another nuclear power, as does Ukraine and the Democratic Peoples Republic of Korea. There was nobody to come to Col. Gaddafi's aid when US-led NATO forces attacked his government, backing rebels seeking his overthrow, and left the country a chaotic mess, which it has remained now for six years. And until Russia stepped in, the same was true of US backing for Islamic rebels seeking to overthrow Syrian President Basher Al-Assad. Ukraine was something of an exception, with the US backing a coup in 2014 that ousted the country's elected pro-Russian president, installing in his place a pro-US regime, despite its bordering Russia. My sense is that US warmongers still thought Russia was a backwards mess in 2014, incapable of standing up and with a dysfunctional military. When Russia acted, though, and made it clear, with the annexation of Crimea and with material support of ethnic Russians in breakaway Lugansk and Donetsk, that it would brook no departure of Ukraine into NATO's fold, the US backed off, despite plenty of bluster from the Obama White House and its laughably inept Secretary of State John Kerry. Korea. The Trump administration may threaten to attack, but the bottom line is that a US attack on North Korea, or even a so-called surgical strike on its nuclear weapons development facility or a special forces attack on its leader, Kim Jong-un, would be viewed by China's government as a mortal threat to their country's national security, just as Russia views any effort to turn Ukraine into a US puppet and NATO member as a mortal threat to itself. Actually, there are a number of good reasons to doubt that the US will attack North Korea, nuke test or no nuke test. The first is that China, which is reportedly already moving crack Peoples Liberation Army troops and equipment up to the North Korean border, will not allow the US to conquer and occupy North Korea, the first being that such a move would put US military forces right up on China's border. The second is that US policymakers, even those neo-conservatives who might like the idea of challenging China in principle, know they really have no idea how the North Korean people would react to a US occupation, following an air attack. It's not common knowledge in the US, but the reality is that during the Korean War, US bombers dropped, over a period of a couple of years, a tonnage of bombs on North Korea equal to all the bombs dropped in the Pacific Theater during WWII, killing a third of the country's population. Virtually every North Korean has at least one family member who was killed by American bombers during the brutal onslaught, which was so intense that towards the end US pilots were reportedly dumping their bombs in the ocean before returning to base so they could land safely, because they could find no more targets to hit in the North.